Austin, Texas is one of the coolest and hippest cities in the country. The capital of Texas and the "Live Music Capital of the World" They hold other such notable festivals such as South by Southwest (SXSW) in March and Fantastic Fest in the Summer. This was my third trip to AFF (Austin Film Festival) and it is known as the "Writer's Festival" putting much of its focus on the art and craft of screenwriting. Along with a full slate of movies, they also hold a weekend writers conference with panels from some of the biggest names in the business. 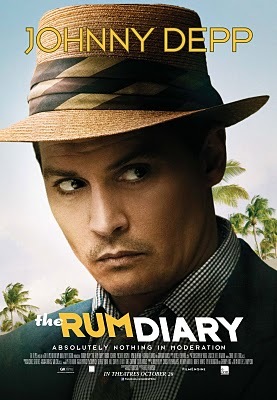 A few days before the festivities it was announced that Johnny Depp would be in attendance for the regional premiere of his new film "The Rum Diary". With "Johnny Fever" taking hold of the city, I had my film badge and got in line for at the time was a relatively short line that quickly snaked through the streets of Downtown Austin. After about a two hour wait I was able to secure a front row seat on the left corner. After a bit, more waiting film critic Elvis Mitchell introduced Director Bruce Robinson and finally, Johnny Depp made a brief appearance. After the film, Elvis, Bruce, and Johnny came on stage for a Q & A. Bruce seemed to have hit the backstage "refreshments" a little hard and was a bit out of it. Johnny on the other hand was tack sharp with wit and humor. Working the crowd like I'm sure he's has done a thousand times. He described his relationship with "Rum Diary" author Hunter S. Thompson and the struggle to bring this film into fruition. After a few audience questions, it was time to say goodbye. A number of festival-goers rushed the stage for an autograph and his security team quickly turned them away, but Johnny stepped forth and knelt at the end of the stage and began signing. I was able to get through and he signed my festival badge. Quite the experience all around. As for the rest of the festival, I saw retrospective showings of Whit Stillman's "Metropolitan", and the animated classic "Toy Story" with Pixar frontman John Lasseter in attendance. The documentary "Cinema is Everywhere" takes a look at how movies are made and viewed all over the world. On Saturday night I saw "Jeff, Who Lives at Home" the new film from the indie favorite Duplass brothers and was the best film I saw at the festival. Starring Ed Helms, Jason Segal & Susan Sarandon. 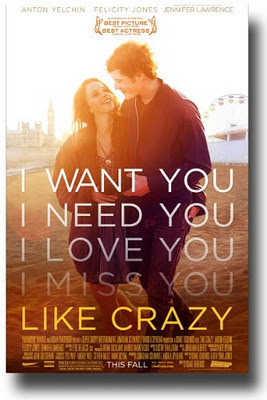 The last night I was there I was able to see the Sundance Film Festivals Grand Jury Prize-winning film "Like Crazy" Starring Anton Yelchin and Felicity Jones. About a British college student (Jones) who falls for an American student, only to be separated when she's banned from the U.S. after overstaying her visa. This is a truly a great festival and would highly recommended it to writers, filmmakers, or just plain movie lovers, but to be honest this is really the only festival I've been to so I am just a little bias. "The Human Cetipede 2 : Full Sequence"
Lars Von Trier's Epic "MELANCHOLIA"